Chancy, from Snappys Sports Senter, was on Smith Lake Monday and there was only about 4 to 5 inches and there was lots of pike and some big perch out there. 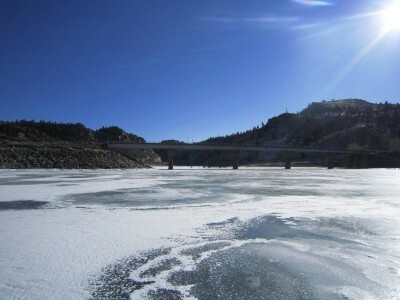 Rodgers Lake 3 -4 inches of ice on the South end for grayling and cut throat, not a lot of ice out there otherwise. The Flathead River still catching whitefish down by the evergreen, and in the lower section you can pull in some nice macks but be sure of the regs now that most of the rivers and streams are closed for the season. Leonard from Robert’s Bait and Tackle says still not a lot of ice out there. Fresno 4-6 inches in the back bays, Bailey has a good 6 inches, Arod has 5 inches on the main lake, Francis froze over again but it’s not safe. Holter is still wide open for trout along the shore, Tiber’s still open and producing jigging with minnows and a jig. Heard Nelson’s got 10 inches, and the river’s been producing now that it’s settled down and no moss running. If you have any questions or need rod & reel repair call Leonard 406-454-1877. Shelby from Rocky Mountain Supply in Dillon says stores been busy for the holidays. There’s been a little dusting of snow in the area. The ice on Clark Canyon has finally come in, not a lot but its there, about 4 inches in areas. And there’s still water fowl hunting’s going on in the area as well. If you’re in the Dillon area, stop into Rocky Mountain Supply for more information or call 406-683-2308.